Are you a Counsellor, Psychotherapist or Psychologist – or studying to become one? Do you love what you do but find the business side of things a bit daunting? Are you struggling to fill your practice with clients? It took me more than three years of full-time private practice to catch up with and exceed my salary in employment. And I had to learn to become comfortable with all the professional and personal issues self-employment raised. In 1994 I wrote a manual called ‘Setting Up Your Own Private Practice in Counselling and Psychotherapy’ which was ground-breaking and remained for many years the only UK publication of its type and format dealing with private practice. It was, and still is, used extensively in workshops and training courses. In 2005, in collaboration with Stephen Palmer and Christine Wilding, my original teach-yourself manual was transformed into a more in-depth book. This became ‘The Essential Skills for Setting Up a Counselling and Psychotherapy Practice’ and has sold hundreds of copies worldwide. But times and technologies change, even in a few short years. The internet is here to stay – and it’s a wonderful place to learn and share knowledge. I believe it offers a great opportunity to update and improve upon what’s gone before. 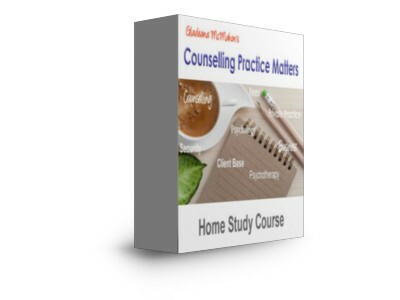 The ‘Counselling Practice Matters Home Study Course’ is my newest and extended work which has been brought right up to date. In it I guide you each step along the path to set up and build your own successful private practice. You can follow and complete each activity in the guide at your own pace. Today there are many more new counsellors and psychotherapists setting off on the exciting road of opening their private practice and becoming self-employed. If you’re one of them, this Home Study Course is one way you can benefit from all my experiences. I want to share this information with you straight away so the ‘Counselling Practice Matters Home Study Course’ is available as a downloadable file (in PDF format). What this means is that I can keep the price low and you’ll be downloading your copy of the Guide within a few short minutes of placing the order – no matter what time of day it is! You can own the updated and revised ‘Counselling Practice Matters Home Study Course’ for just £34.99 (+VAT). PS. Remember, I found all this out the hard way – but you don’t have to. Just click on the ‘Buy Now’ button below and get instant access to this definitive guide – with more than 15 years proven track record of helping hundreds of Counsellors, Psychotherapists and Psychologists to set up and build successful private practices. PPS. Please note this is a virtual product and the image is for illustration purposes only.